Eugène Lamy, Paris, a gift from the artist, and thence by descent to Mme Drouilly (née Blanche Lamy), Paris, by circa 1951, and thence by descent. Purchased from the heirs of Madame Drouilly by the previous owners circa 1977. M. Berhaut, Caillebotte, sa vie et son oeuvre: catalogue raisonné des peintures et pastels, Paris, 1978, no. 369 (illustrated p. 205). M. Berhaut, Caillebotte, sa vie et son oeuvre: catalogue raisonné des peintures et pastels, Paris, 1994, no. 403 (illustrated p. 221). Paris, Galerie Durand-Ruel, Exposition rétrospective d'oeuvres de Gustave Caillebotte, June 1894, no. 121. Paris, Galerie des Beaux-Arts, Rétrospective Gustave Caillebotte, May-July 1951, no. 64. Painted in 1889, Portrait d'Eugène Lamy is a highly personalised depiction of one of Caillebotte's close friends. A fellow yachting enthusiast, Lamy is here depicted with the Bassin d'Argenteuil as a backdrop, bristling with the masts of the pleasure and racing boats both men adored. The features in the background are a personal testimony to the joint interest of these men in their sport of choice, and the location itself is particularly appropriate both as the scene of much of their racing activities and as the main focus of their friendship. The Bassin d'Argenteuil was the centre of competitive yachting near Paris, being the home of the Cercle de la Voile de Paris. This even seems to have influenced Caillebotte's purchase, eight years earlier, of a property at Petit Gennevilliers, on the other side. Caillebotte probably met Lamy through their mutual enjoyment of racing boats, and they indeed seem to have had their names often linked in this pursuit, even within France's racing circles. The year Portrait d'Eugène Lamy was painted, Caillebotte not only spent a great deal of time racing, but also met with considerable success as his boat, the Thomas, won many of the regattas in Argenteuil and elsewhere-- perhaps helping induce the gaunt look on the subject's face. The purchase of the house at Petit Gennevilliers came none too soon. When tensions in the Impressionist group became too much, Caillebotte essentially retreated there, devoting himself to designing and constructing his boats and cultivating not only a lush garden but also his fine collection of Impressionist paintings. These pursuits had an intense impact on Caillebotte's works. He had become more and more affected by the petty in-fighting of his fellow Impressionists, and was to an extent constrained by their increasing orthodoxy. On moving more or less full-time to Petit Gennevilliers, Caillebotte's art flourished. The urban and urbane scenes that had previously marked his work were eschewed for lighter themes and, where paintings like his Le Pont de l'Europe, a gift from the artist to Lamy, had been concerned with life in the modern city, now Caillebotte explored nature, and especially the contrast between nature and engineering. It was this theme-- modernity in nature--that Caillebotte seems to have most enjoyed, hence his many depictions of the bridge, a development of his amateur interest in engineering. Engineering always had an influence in Caillebotte's works, not least in his use of perspective and composition. Caillebotte did not seek to capture the 'impression' of a moment merely through spontaneity, but instead by constructing pictorial formats that, while remaining true to their subjects, nonetheless created an impression of subjectivity, of literally seeing through the artist's eyes. Hence, in Portrait d'Eugène Lamy, the perspective seems somewhat rakish, the path appearing to climb at an uncannily steep angle. This creates a sense of immediacy, the fish-eye effect pushing Lamy himself into the fore. The dabbed application of the paint conspires with this slightly distorted feel to add to this-- the hatched strokes seem to document a frenzy of activity on the artist's part. This style, with its small strokes, speaks of the influence of another of Caillebotte's great friends, Pierre-Auguste Renoir. The flesh-tones especially are reminiscent of Renoir's works. Renoir and Caillebotte had been friends for years by this time-- Caillebotte was even the godfather of one of Renoir's sons. It was in the relative seclusion of the verdant Petit Gennevilliers, though, that Renoir's influence began truly to reveal itself in Caillebotte's works. When it came to selecting his sources and influences, Caillebotte had a great advantage in that he owned so many works by his fellow Impressionists. Amongst this collection, he had a particularly diverse collection of Renoirs. Effectively, maintaining a distance from Paris and the Impressionist factions, Caillebotte could pick and choose his influences from the walls of his house. Another great influence evident in Portrait d'Eugène Lamy, and indeed another reason that Caillebotte moved to Petit Gennevilliers, was the veteran Impressionist Monet. One of the first of the group that Caillebotte had met, befriended and later sponsored, Monet had been the great Impressionist pathfinder in settling in Argenteuil in 1871. In doing so, he placed it at the centre of so much artistic activity, and almost every great Impressionist came to paint there at some point. Caillebotte loved Monet's work and was, in particular in his early years at Petit Gennevilliers, heavily influenced by his sense of light and colour. Even in Portrait d'Eugène Lamy, the light and treatment of the water seems to retain a vestige of Monet's influence, albeit adapted to Caillebotte's own pictorial needs. Caillebotte has explored the potential of Monet's light effects by placing Lamy largely in the shadow. This adds an authenticity to the portrait, while also showing Caillebotte's explorations of light. 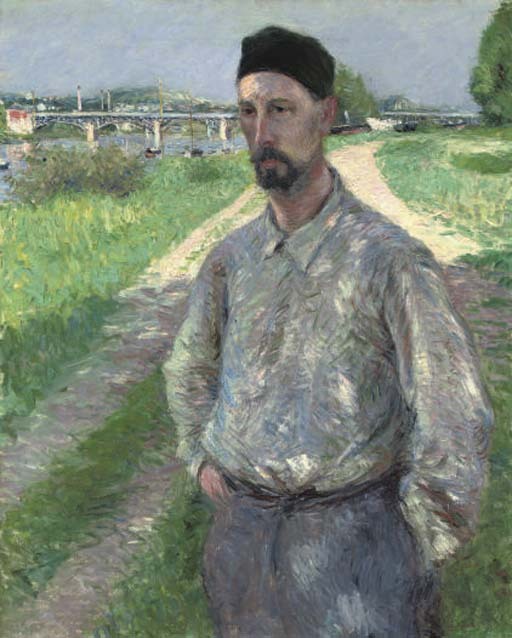 Indeed, the contrast between the shaded Lamy and the bright, sparkling Bassin d'Argenteuil behind create an Impressionist chiaroscuro that Caillebotte further manipulates with the plays of light on the subject's face and shirt, pushing his subject increasingly into the realm of the viewer.